Dynamic Benchmarking to create web-based platform to conduct, aggregate and analyze results of the National Management of an Accounting Practice survey. Dynamic Benchmarking, a provider of customized online benchmarking and reporting solutions, is pleased to announce that it has been selected by the American Institute of Certified Public Accountants (AICPA) to develop a benchmarking platform for the 2014 AICPA PCPS/TSCPA National Management of an Accounting Practice (MAP) survey. The AICPA is the world’s largest association representing the accounting profession, with nearly 386,000 members in 128 countries. The survey is sponsored by the AICPA Private Companies Practice Section (PCPS), the Texas Society of CPAs (TSCPA), and AON. The AICPA PCPS is a firm-based membership segment of the AICPA that provides tools, publications and other resources in the area of accounting practice management. The AICPA PCPS has co-sponsored the National MAP survey with TSCPA since 2002, providing public accounting firms with financial and firm practice management data and the ability to compare their firms with others around the country. The AICPA PCPS/TSCPA National MAP survey solicits data from practitioners on key data points including: financials, firm demographics, compensation and benefits, technology usage, partnership succession and other areas. The new, online platform from Dynamic Benchmarking will be used to conduct, aggregate and analyze the results of the AICPA PCPS/TSCPA 2014 National MAP survey in an efficient and customizable manner. Participants can enter data anonymously at their convenience using a secure, online portal. AICPA PCPS members participating in the survey will be able to retrieve firm-specific comparison reports that are customizable through Dynamic Benchmarking’s unique filtering processes. The AICPA benchmarking study is scheduled to be released to members later this year. Dynamic Benchmarking is a New Hampshire based startup that delivers real-time benchmarking and data analysis solutions with the features and capabilities of custom software in a format that is easy to use and quick to deploy. 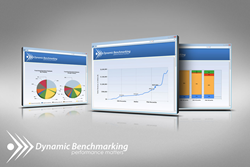 Founded by a team of women entrepreneurs, Dynamic Benchmarking combines powerful, web-based technology with unparalleled industry expertise and customer care to provide best-in-class, peer-to-peer data comparison for small business, associations, large enterprises and any organization looking to tap into the knowledge of the crowd. Dynamic Benchmarking builds web-based solutions that are flexible, scalable and allow for meaningful comparison of financial and operational performance in a dynamic and interactive manner. For more information, please visit http://www.dynamicbenchmarking.com.